If it's nowhere near Oktoberfest and I'm sipping a soft drink as I walk, can I possibly experience the real Munich? Apparently so, according to Iain. He's the British guide on Radius Tours' daily Bavarian Food Tour, which wends its way through a compact area of the German city. Starting from the main train station, each member of our small group has a German soft drink thrust into their hands (mine's a cheeky pear and rhubarb flavour) as we head into the streets of the Old Town. Everyone knows about Munich's famous beer, so today is devoted to discovering its less-celebrated food. Not that that's going to stop Iain talking about beer. 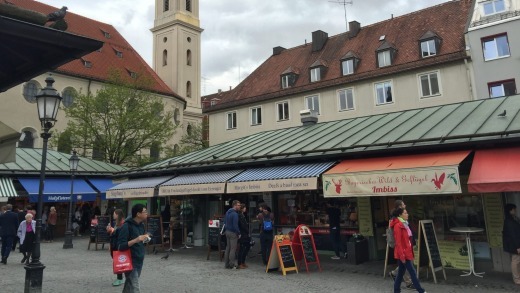 Once we arrive at Marienplatz, the main square dominated by the grand town hall, he tells us about the evolution of beer gardens, and how beer festivals developed to use up old stocks before the post-harvest new brew. But we're really here to talk food, so he leads us first to Dallmayr. This upmarket delicatessen dates back to 1870, and has belonged to the Randlkofer family since 1895. Through war and depression they built a hugely successful business, and the interior still has a luxurious sheen. There's also a lot of colour and theatre, as we navigate our way past bright displays of fruit, cheese, seafood, meat and delicious-looking chocolate mousse. 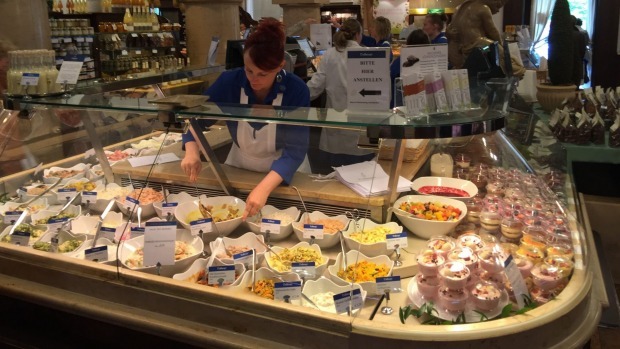 Making the rounds is a good way to get an overview of local food, and Iain mentions some popular items you can find here, including sülze (pork in aspic) and obazda, a cheese we'll be hearing more about later. As I browse, it strikes me that a full picnic spread could be assembled here at reasonable cost. And as the attractive Marienhof square is just across the road, consumed in comfort soon after. But for today at least, we must move on. Our next stop, the Viktualienmarkt, is an open-air market comprising food stalls and beer gardens, creating a series of small squares. Iain leads us to a butcher's stall which sells fresh meat and can cook it on the spot. Each of us receives a plate with a bread pretzel, a sausage and a blob of honey mustard. 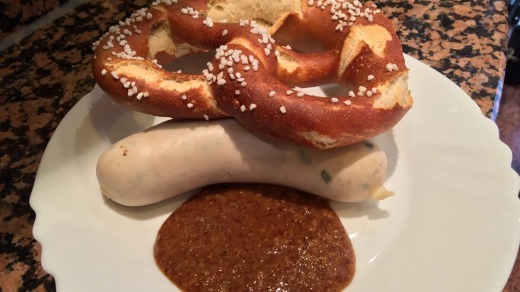 The sausage is weisswurst, and it looks as white as its name suggests. It's a blend of pork and veal, flecked with parsley. It's a filling snack, but there's more to come. We stop at a bread stall to marvel at the dazzling array, but it's a nearby cheese shop that really catches our attention. Its display window is alive with bowls of flavoured soft cheeses of various colours. Among these is obazda, a Bavarian specialty that's made by blending aged Camembert with butter and diverse flavourings. It's said to have been invented in order to make old cheese last longer. While Iain goes in search of a picnic lunch, we take a seat at a table at the adjacent beer garden. While some tables attract waiters, those without tablecloths can be used by people sourcing their own food from the surrounding stalls. Our guide returns with a selection of German breads, sliced by the seller, including one with pumpkin seeds and another featuring carrot and sesame. 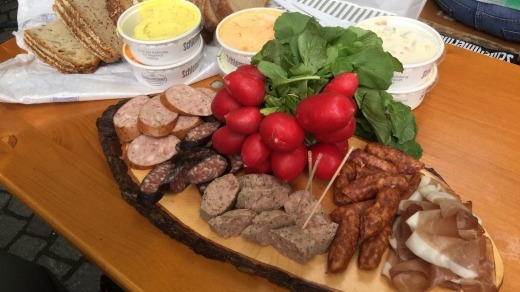 To this he adds an informal meat platter, with slices of bratwurst, liverwurst and German-style salami, among others. Then the containers of soft cheeses are opened, flavoured with elements such as horseradish, chilli, paprika, wild garlic, and honey and mustard. At the centre of all this is a big bunch of radishes. It's supposedly a palate cleanser, though I suspect it's there just to make the hefty spread look vaguely healthy. As we eat, surrounded by tables of relaxed drinkers, we chat about food and its place in Bavarian culture. Though locals do use supermarkets for general goods, says Iain, they also support their local butchers and bakers. And though Germany's general shop closure on Sundays can be a nuisance, it also helps foster social cohesion as people get together at a cafe or beer garden instead. This is a more social tour than many I've been on; instead of finishing and leaving, we linger over food to talk about all sorts of topics. When Iain explains gemütlichkeit, a German word suggesting a sociable warmth, I realise that's exactly what we have here. We end with a freshly baked doughnut bought from a small bakery and eaten on the street. But it's a doughnut cooked in the traditional manner: in lard. Old school. Qantas (qantas.com.au) and partners fly from Melbourne to Munich from $1600 return. GHotel, Baaderstrasse 88, Munich, ghotel.de. Hotel Blauer Bock, Sebastiansplatz 9, Munich, hotelblauerbock.de. Radius Tours' Bavarian Food Tour departs at 1.30pm on Monday and Friday. Adults €25, children €15. Bookings via radiustours.com.